We wanted to remind you of our Fall Frenzy happening tomorrow through Saturday. also, remnants will be 50% off. 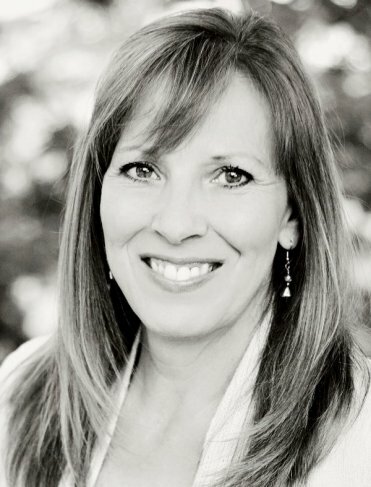 On September 11th (Thursday) at 6:00 pm we will be showcasing Deonn Stott from Quiltscapes. 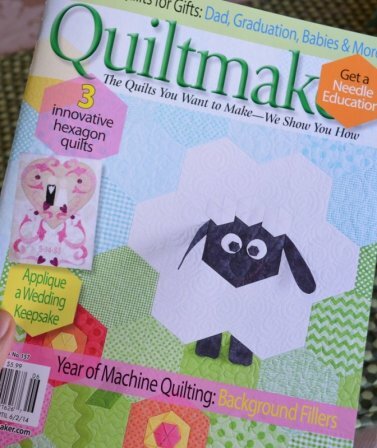 Deonn will demonstrate a faux-piped binding technique and easy hexagon projects including her Hexie Meadow Sheep Shape baby quilt as featured on the cover of May/June 2014 Quiltmaker magazine. An accomplished quiltmaker, designer, quilt coach and teacher, Deonn’s personal quilt quest is to find time-saving tips, tricks and tools that simplify and make the process of quiltmaking even more enjoyable, especially for new quilters. 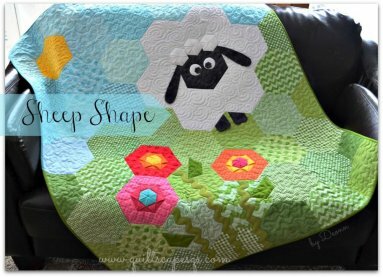 In addition to operating her longarm quilting business, Quiltscapes, she writes monthly tutorials and is featured in a series of How-to-Quilt videos for Riley Blake Designs. We look forward to you seeing you there! We have a few new notions that are sure helpful. 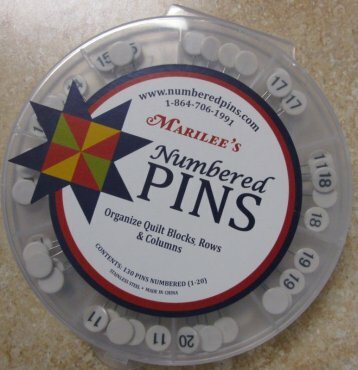 Numbered Pins is the perfect solution for organizing quilt blocks, rows and columns when order is important to the design of the quilt. Use these high quality, stainless steel, flat head pins as a simple tool to keep your project organized without disturbing your layout. Simply pin a Numbered Pin in the upper left hand corner of a block, row or column to keep track of specific pieces as you rotate or shift your fabrics. 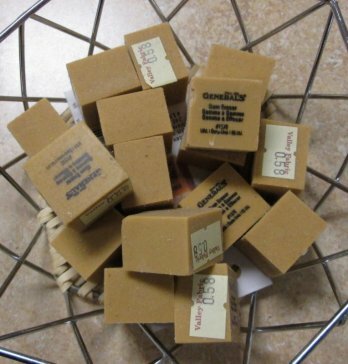 A quantity of pins for each number (1-20) is provided for easy organization for any sized project. Numbered Pins are a great alternative to masking tape, especially when residue can damage the fabric, and they replace those annoying, one-time-use sticky notes. Need to add more numbers, letters or color codes? Simply customize the back of each pinhead with a permanent marker. Our reusable product will not damage fabric and remains stationary while assembling your quilt. 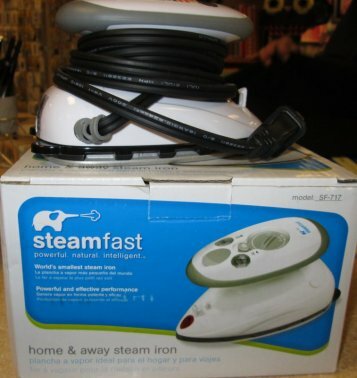 This is a great steam iron to take to classes along with in your luggage for get-aways. We now have the latest and greatest sewing table that will help you complete your projects with ease. It is called The Sewer's Wish. 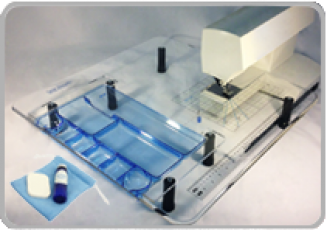 It is a 22 1/2" x 25 1/2" table with beveled edges on 3 sides, a 9" x 14" compartment tray and a tray lock. It also comes with a table polish kit, a circle sewing kit and it has the new universal table grid. We will be featuring the table during our Fall Frenzy. Order yours today and we will add in free of charge a travel bag for when you come for classes. Don't forget to add this on your wish list to give to your family at Christmas time! I think this is about the neatest gift for yourself along with ALL of your Quilter friends. 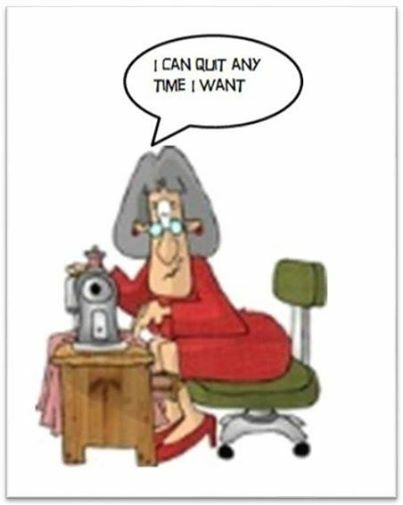 You use it on your cutting mat to get all the excess fabric that is left in the cutting lines. THIS WORKS! These scissors are great and come in pink! Also included is a gift wrap cutter! While supplies last, you get the top, back and binding for $14.99. You just can't beat that! 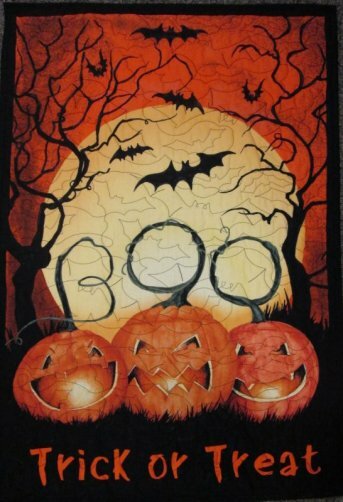 An added idea is to use the Soft and Stable batting in the wall hanging then add the lights to it and you have a cute and fun Halloween decoration. Ok, you all know we are hiring here at the Fabric Shop and we decided to hire a part time, seasonal employee! He fits all of the criteria we have listed below. So, please come welcome, Mr. Chillingsworth. ....Then we would love to hear from you! If you or someone else you know is interested, please bring your resume in to Bobbi or Charla.